"Last minute problem solver at its best! " There are various options to choose from, especially when it comes to doing niche work like voice overs. You can review recent orders from the person you're looking to work with. Some of the work on there does lack professionalism depending on the budget you're looking to spend. A lot of stuff seems that it might have copyright problems, and some work seems not authentic. Know exactly what you want and don't be afraid of spending a little bit extra over your budget. Sometimes the five dollar design will be a complete waste of your time. Last minute stuff usually involves voice overs for clients, content creation, and copy writing. The best thing about it you're able to choose from a lot of different users and it shows you a time frame the work will be completed in to integrate into your schedule. "Easy invoicing, time tracking and task management "
This is a system that is easy to use if you are not familiar with "box" or online accounting systems. It allows for task management, time tracking, invoicing and so much more to all happen in one place. I also love that it integrates with other software I am currently using. Oh yea - and it's FREE!!!! The invoices are not as customizable as I would like. I haven't found a way to make them blend in with my current business theme. Try it - it's free and will absolutely change the way you operate the back end of your freelance business. I am able to keep all of the information needed for projects in one place. From initial contact with a client to management to billing, it is truly a one stop shop. 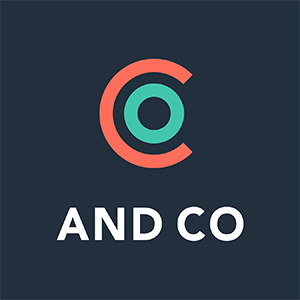 I love how and.co is an all-in-one platform that I can use from prospect to paid and for ongoing client management. I can finally stop jumping from system to system to create proposals, then contracts, then invoices. Such a time-saver! I honestly haven't found much to dislike about this service so far. If anything, I wish it integrated with QuickBooks, but it seems like WePay (which I set up via the system) will work well. Go for it! Make sure that it has all the features you need and then jump in and you'll be able to replace so many different systems for one, simple, integrated system. I went from using four different programs to manage my clients to using ONE - and.co! I am solving a lack of efficiency and a lack of having all my information in one place. I was using GSuite to create and send proposals, then DocuHub for GSuite to create contracts and then QuickBooks to send invoices. While it all worked, it was not efficient. This has been such a time saver for me and helps me feel more organized (and look more organized to my clients). I loved how easy it was to use the systems and tools the software comes with. It helps take the strain off me when managing my small team, tracking hours, sending out invoices, etc. I don't know that there was anything that I disliked in particular. Great service to help with problems too. I think that any small business who is looking for an easy to implement suite like this, should give And Co a shot. I am managing a small business and this tool helps me manage projects, invoices and employees. Awesome in all features, freelancers getting paid became a so easy task with and.co. Basically free, meaning zero charges to get it started. There is a premium version of course. Proposals are very easy and fast to create. I can't tell you how much amazing this is for freelancers. Go for it. "Helpful and does what it needs to"
The option to build a signable contract with an invoice and deposit all at once is very handy. It looks professional and allows my clients to pay with Stripe OR Paypal, an advantage over PP alone. Requesting a deposit on a project is not intuitive and I frequently end up with duplicate projects as I try to figure out how to make it work. Create any additional terms or documents to include with your contracts before you need them so they'll be easy to upload. Design and upload a logo so that it matches the rest of your branding. Invoicing is smoother and looks better. I don't make much use of time tracking features but it's handy to have them. "Easily invoice and track clients"
The program is very easy to use and it keeps track of when you send an invoice and when it was paid. Super helpful for anyone with freelancing clients! I wish there were more options to customize how an invoice looks. The text styles and layouts are very simple. They get the job done, but some more options would be nice. Works great for creating and tracking invoices. It also has numerous other helpful tools like a timer and other organizational tools. Highly recommend! I use it to send invoices for freelance writing work and projects. It allows me to look professional and upholds a high standard. I really liked the ease of project management features and subscription billing. I was looking for a platform to bring everything from my freelancing clients under one system. -They're forcing everyone into a pay model that isn't competitive in the least. -Pay to play with terrible fees and god awful lead times on billing. -Autopay will bill your clients whenever it feels like on the day, leaving you with inconsistent cash flow if it lands on a weekend. Their support is nonexistent and have no power to fix or check on anything. "Let me check with the engineers"
Literally, any other platform probably has more value. They offer the world until you're too deep to bail on them. Nothing anymore, the platform has created a number of problems for me after they switched everything up to milk their audience even more. "Great site to earn pocket money"
Easy way to earn pocket money if you can manage your rating and review. If you're willing to working hard on self promoting your gig, this could be for you. "Fantastic free option for budding freelancers"
Project management within the dashboard makes it easy to take note of everything you need to keep track of in order to be organised. As it’s quick and easy to add and manage products, it helps with keeping records. Other features such as proposals and book keeping make this very well-rounded! Alerting and reminders could be a bit more forceful or persistent, especially as this solution is intended for those less organised individuals to gain structure. The pluses generally outweigh this though. - Per project note taking and scheduling. - Quick and easy proposals. For me it’s solved the issue of forgetting project-specific details, particularly for those projects where there’s a large gap between discovery and execution. This is a great application for Invoicing, Expenses and Income Recording and proposal and contract. I have been using it January 2018 and I can tell you its helping. It help me to work small by keeping record of all clients and invoice. With and.co am able to monitor all expenses and income and its absolutely FREE. So far So Good. Nothing that I dislike about the application. The ease of use of the product. I could easily follow the directions as given to me without felling like I couldn't use the product adequetly. Not having known about the product earlier. It could have cut down on the usage of other products that were not as efficient. I think like companies should tell benefits as well as drawbacks when presenting products for usage or purchase. The benefits are quicker results and turn around time. "Absolutely love my personal experience with Fiverr and.co and all of the talent on the platform! " The ease of usability and the ability to view other work from around the world in an instant! The quality is also superb and the talent is willing to execute on your feedback making their freelance network and essential for any agency. We also love how easy it is to pay talent, that's always and overlooked aspect of many other tools. Sometimes, incorrect judgements can be made and the work produced might not be what was expected due to cloudy communication. Over promising talent on projects and being able to free up my staff's time so they can execute their daily duties better. I like the ability to track your hours easily and able to invoice your clients. What I dislike is the fact that some features are unavailable, like looking at what hours you have yet to invoice. We are solving the need to have to purchase a time tracking app. "Great for quick turnaroud projects"
I like the fact that I can choose the person I want to create things for me and develop a rapport. It allows both of us to understand each others style. Unfortunately, there are some people that are not honest about their skill set. This causes frustration and wasted time when looking to use the end product quickly. I am able to get work finished sooner because we only have 2 people creating designs. It allows us to add more products, images, and listings. "Perfect for those used to the gig economy"
Sometimes the seller aren't as vetted as they should be. create invoices from projects or proposals. Invoice for items but you have to manually enter the items. * We monitor all and.co reviews to prevent fraudulent reviews and keep review quality high. We do not post reviews by company employees or direct competitors. Validated reviews require the user to submit a screenshot of the product containing their user ID, in order to verify a user is an actual user of the product. Hi there! Are you looking to implement a solution like and.co?